Protects your privacy on the Web. Is there a better alternative to DoNotTrackMe? Is DoNotTrackMe really the best app in Security category? Will DoNotTrackMe work good on macOS 10.13.4? 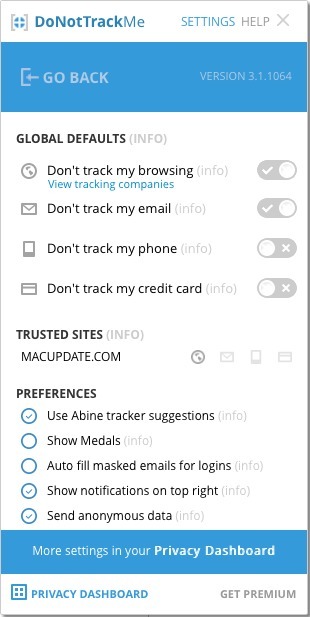 DoNotTrackMe stops companies from tracking you. Ad companies and social networks are tracking everything you do on the web. They know what sites you visit, when you visit them and how often you do...and they know who you are. DNT+ blocks the tracking so you can browse freely and safely. Version 3.1.1064: Release notes were unavailable when this listing was updated.